The "East West" Mini-hotel is favourably located in prestigious area of Moscow, in 30 minutes of driving from the airport of the Sheremetyevo and in 10 minutes of driving to Red Square. 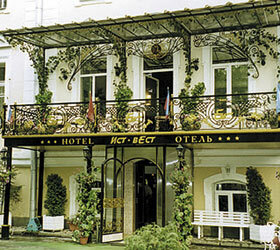 The building of the "East West" Hotel is constructed in 80-s' years of 18th century as a traditional private residence in Russian style to which also internal interiors and furnish of rooms maintain. The court yard of a building of "East West" hotel is small and full of greens. The hotel reliably protects rest of their guests from noise of the Parkway ring. The rooms department includes 25 cozy rooms issued in ancient style and equipped with furniture, satellite TV and the refrigerator. The thought over and original interiors of rooms of all categories immerse lodgers in atmosphere of a cosiness, comfort and rest. Walls of all rooms are decorated with picturesque cloths and replicas of modern artists. A fine view on the Tverskaya parkway - one of the most beautiful parkways of the center of Moscow opens from windows of the rooms of the hotel.